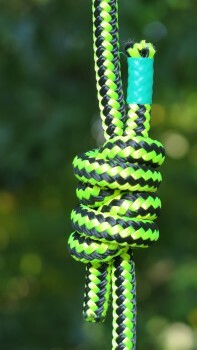 This knot can be used to join two ropes together or the two ends of one rope together to form an endless loop (as in a prusik loop). Once it has been put under load it is a very difficult knot to undo. Look for four parallel turns on one side and two crosses on the other side. Make sure that the tails are at least four times the diameter of the cordage. Also see Barrel knot and Scaffold knot for variations on this knot. There’s no need to hit the volume as this video has no sound.